Are you missing one or multiple teeth, or require full reconstruction of a dental arch? Considering dental implants can improve your confidence and oral health. The innovations of modern implant dentistry provide some of the best options when replacing natural teeth. No other tooth-replacement option will provide a longer-lasting result. Additionally, a dental implant help preserve tooth-supporting bone, which naturally begins to deteriorate after a tooth is lost. This bone loss is a serious and unseen consequence when lost teeth go untreated. At our dentist office, Dr. Sjogren provides the implant-dentistry expertise and knowledge to answer your questions - providing you with dental implant options, surgery details, and additional information when researching your procedure. The implants we provide have a documented success rate of 95-98%. 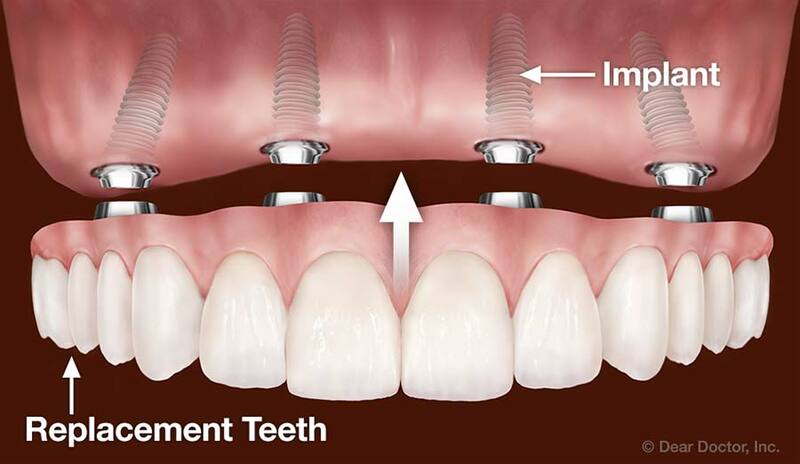 A dental implant (also known as an endosseous implant or fixture) consists of three main components: a medical-grade titanium implant fixture, an implant abutment, and a manufactured crown or bridge. 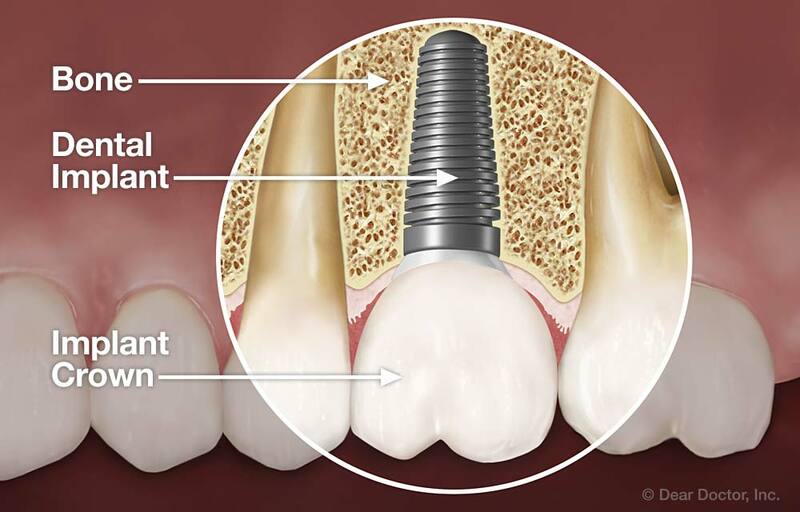 The actual implanted device takes the form of a small, screw-shaped titanium post that functions as the root of a tooth. This implant is screwed into your bone, where it and the bone eventually fuse together. Attached on top of the post is a titanium abutment, which partially nests inside the implant and is fixed to the with a small surgical bolt. This abutment connects and supports the new tooth to the implanted fixture. The final piece of an implant is the dental prosthesis. Our crowns and bridges are manufactured using computer-aided design and manufacturing with CEREC 3D technology. They are precision measured and made to fit and look as natural as your other teeth. The result both looks and feels great while durable and made to last a lifetime. 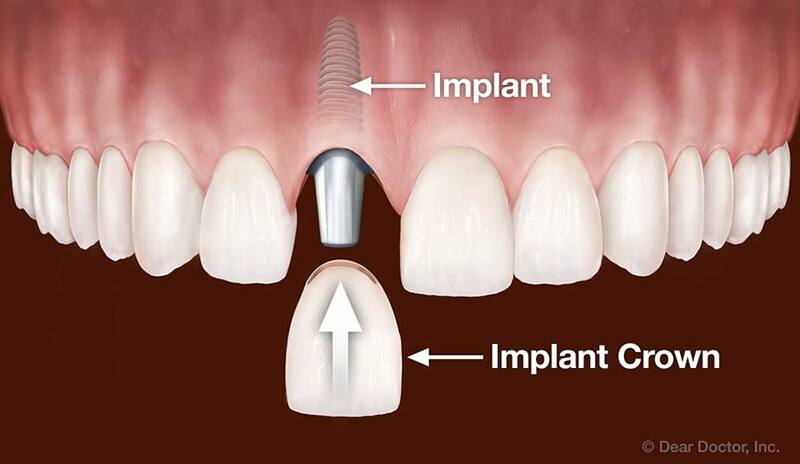 Dental implant surgery occurs during minimally-invasive and outpatient appointments. The actual procedure begins with applying anesthesia, cleaning, and preparing the tooth area. Then, a small incision is made in the gum where a hole is drilled, allowing the titanium fixture to be implanted directly into the jawbone. This procedure is actually quite minor, routine, and in most cases, requires only local anesthesia. 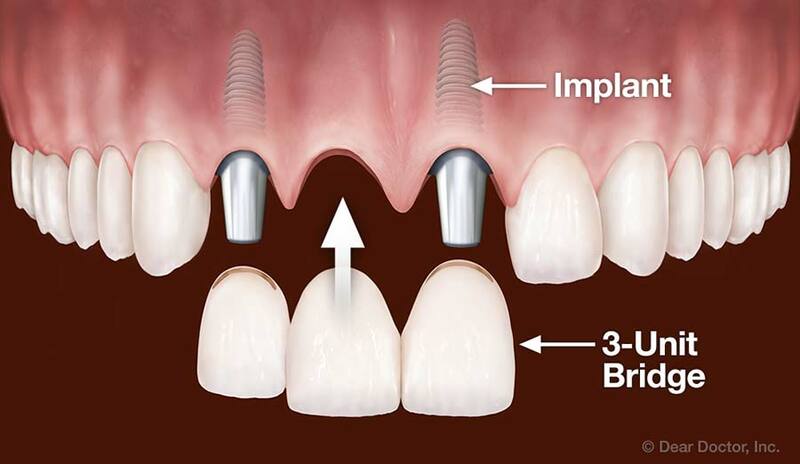 The implant is then capped and the gums are given time to heal. After this healing period, the cap is lifted, allowing the abutment to be placed and seated snuggly inside the healed gum line. During the final step, the implant is topped with a crown (or bridge), custom-made to match your existing and natural teeth. When finally set, your new crown or bridge is the only component visible above the gum line. Patient A has a single, front tooth that is damaged beyond repair and will be replaced with a dental implant. The injury occurred recently and there is no jaw bone loss. Patient B lost 2 molars a few years ago. There has been some gum recession and bone decay occurring as well. This patient requires 2 dental implants during much more intensive implant surgery procedures. These two patients see very different dental implant costs. Each patient required a unique approach to their situation and it becomes difficult to offer an exact cost for dental implants without a consultation. At Show Your Grin Dental, we have a variety of options to address these points. - A dental implant consultation with Dr. Sjogren will determine the best approach for treatment. - This consultation also determines how extensive the appointment(s) will be. - With more information about the procedure and types of dental implants available, our team can develop a dental-procedure plan. - By working with our Dental Insurance Specialists, we’ll identify what your personal insurance plan is able to cover and create an estimate for the remaining dental implant costs. For more information about your insurance coverage, please visit our Finance & Insurance page or Contact Us at the office with questions. Show Your Grin Dental provides in-house financing and coordinates financing options such as CareCredit and Wells Fargo Advantage. When considering dental implants, their costs, and providers, be cautious of low-cost deals. Dental implants are extremely durable and often will last for the rest of your life. It is important to research and contact a reputable dental implant specialist to discuss everything from options, procedures, and costs to receive high-quality dental implants and professional patient care. As the old adage goes, “If it sounds too good to be true…” If you’re still searching for that dollar amount for dental implant costs, the Dental Implant Center out of Dallas mentions on their website that a single dental implant can costs between $1,000 and $3000. Obviously, there is a great amount between the two costs and the actual cost for dental implants varies as much as individual needing one does. There are only two ways an implant can lose attachment to the bone and fail once it has successfully fused. First is poor oral hygiene habits. Poor oral hygiene, including a lack of regular professional cleanings, may lead to a destructive bacterial infection called peri-implantitis. By flossing and brushing your teeth on a daily basis, along with regular dentist visits, this can easily be avoided. The second is excessive or extreme biting forces. These biting forces often come from either a habit of clenching or grinding your teeth, an insufficient number of implants to handle the forces generated by your bite, or the deliberate chomping on hard items. If you have a habit of grinding or clenching your teeth, a Night Guard will be recommended to protect your implants. Also, the correct number of fixtures should be implanted to support your new crowns and be careful when chewing hard foods like hard candies, seeds, and nuts. After all, dental implants are a lifelong investment in your smile, your health, and your well-being, and it's best to protect your investment.